Home » Living the Enraptured Way » Living the Enraptured Way » Hear Melissa Danis in concert this Thursday! Hear Melissa Danis in concert this Thursday! 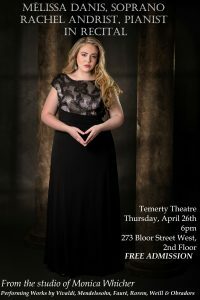 Melissa Danis, this year’s recipient of the Dianne Forsyth Vocal Scholarship at the Royal Conservatory of Music, will be performing on Thursday, April 26, at 6:00 p.m. at the Termety Theatre. The theatre is on the second floor of the Telus Centre for Performance and Learning, 273 Bloor Street West, Toronto. Admission is free. Attendees at the Kenneth G. Mills Foundation’s last Christmas party heard this delightful soprano. If you haven’t heard her yet, this is a great opportunity to enjoy her soaring voice and warm presence. The Kenneth G. Mills Foundation supports the Dianne Forsyth Vocal Scholarship as well as sponsoring individuals and projects within arts and education. ← Who will win the awards for best poetry and singer-songwriting this year?